Here is a list of websites to learn Russian Online. The following list of Websites can be used by beginners, intermediate, as well as advance Russian language learners. The presence of language learning tools, like video lessons, audio support, tests, quizzes, flash cards, picture representation, etc. make these websites quite capable players in the game. 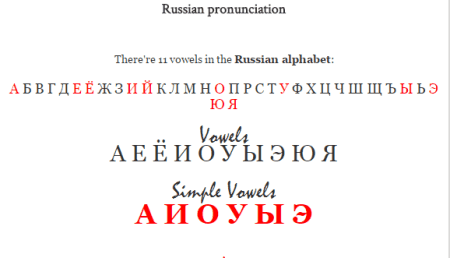 Russian alphabets, vocabulary, phrases, basic grammar, advanced grammar, pronunciation, you name it, you will find these lessons in most of the websites mentioned here. Russian is a Slavic Language, which is the official language of Russia, Kazakhstan, Kyrgyzstan, and Belarus. This language is the 7th most spoken language in the World, with more than 150 Million native speakers. 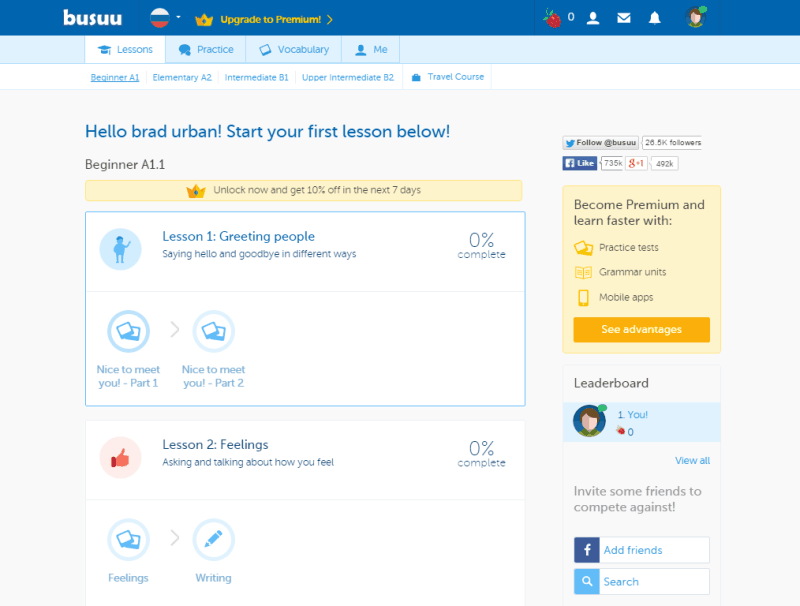 Busuu is a multi-language learning platform, where you can learn Russian for free. It has Russian language learning course for almost every level of learners. 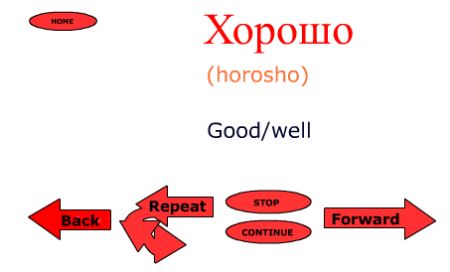 You can move step wise, to learn Russian from the basics. Sign-in to keep a track of your progress. 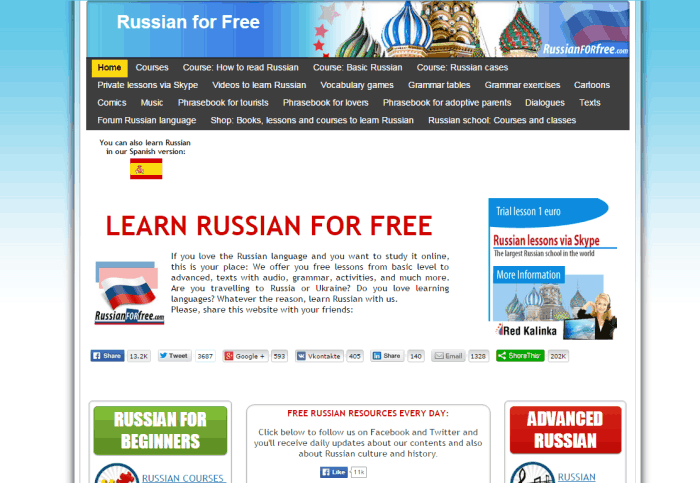 Fully supported by audio, this is one of the best free resource to learn Russian language. You can also check out the list of best websites to learn Turkish Language, French Language, and Korean Language. Learn Russian language online for free at Busuu.com. 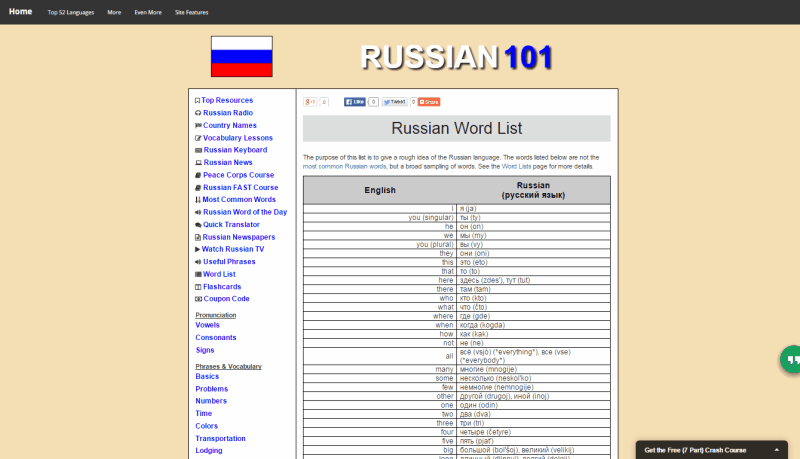 It has one of the most extensive resources to learn Russian language. You need to sign up for free to begin learning Russian language. The list of lessons to learn Russian language include: Beginner, Elementary, Intermediate, Upper Intermediate, and Travel Course. You can begin learning Russian language with the basics of the language, like basic vocabulary and phrases. Busuu lets you track your progress with the course, as you advance through it. 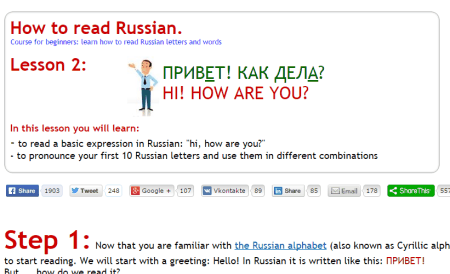 Practice Russian language, take test, and strengthen your Russian vocabulary with the help of various interactive tools present on this website. A free account lets you learn only one language at a time. If you want to learn more languages, then you have to go premium. 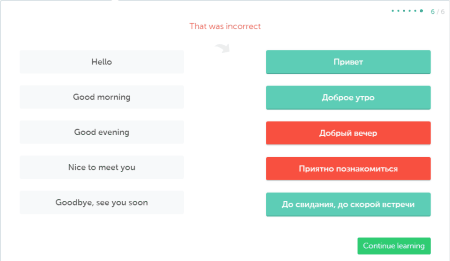 Learn Russian efficiently at Livemocha.com. 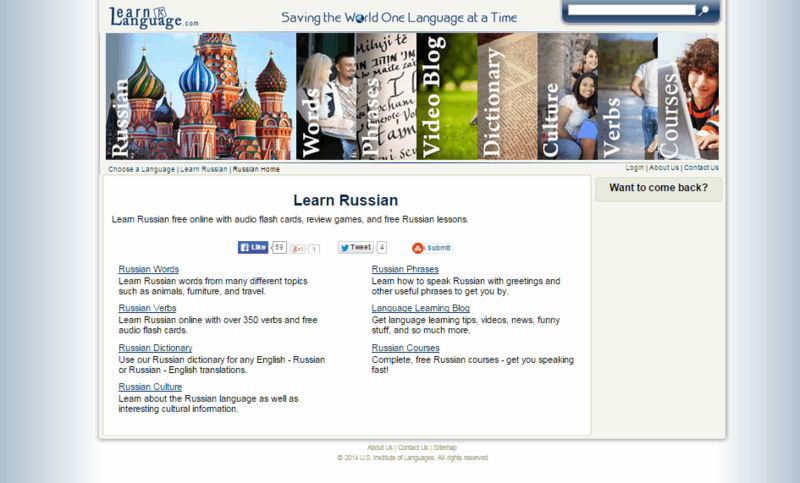 This language learning website offers free course in Russian language. You can start learning elementary Russian by taking lessons, such as: Russian alphabets, numbers, vocabulary, and general phrases. Advance to higher levels to learn Russian grammar, sentence formation, and complex phrases. You are provided with some coins at the time of Sign-up. Use these coins to unlock lessons. Earn more coins with the completion of each lesson, and use them to unlock other lessons. Learnalanguage.com provides quality content to learn Russian language for free. 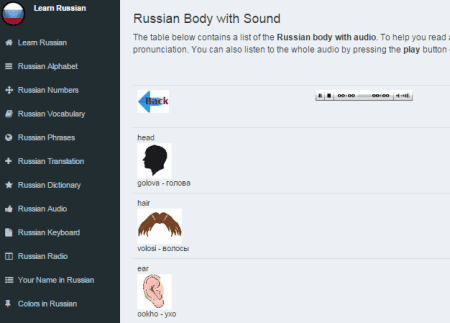 The Russian words, verbs, and phrase modules are supported by audio playback. The audio lets you understand Russian language easily. The Russian dictionary may turn out to be a good help to learn Russian language. Links to Russian Language learning blogs is an added advantage. Take a look at the Russian culture module to know more about Russian and, history of Russia. Learn Russian language for free at Loecsen.com. 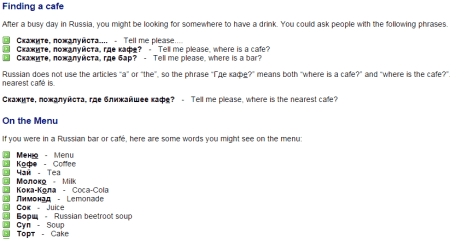 The Russian language learning course on this website is based on conversational phrases. Common phrases used at different places and situations have been listed on this language learning website. These lists of phrases are translated into Russian language, and are supported by audio playback. Image illustrations have been provided for each phrase, to understand the situation where a phrase can be used. You can download the PDF, and audio of the Russian course as well. Russian language learning course is available for free at DigitalDialects.com. The Russian language course consists of 15+ modules. 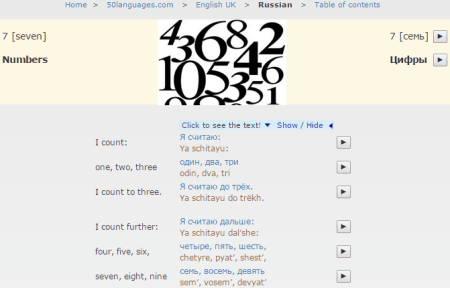 These modules teach you Russian alphabets, numbers, vocabulary, time units, phrases, and much more. The modules are audio supported, and easy to understand. You can also learn elementary, and advanced Russian grammar at this website. 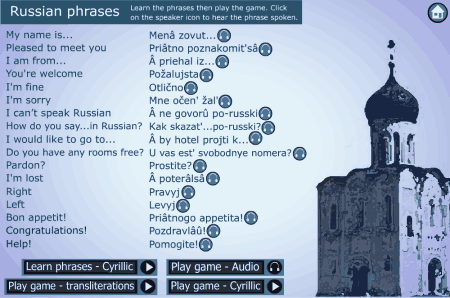 Free language games are added advantage to improve Russian language skills. PrivyetRussian.com offers free course to Learn Russian online. It doesn’t matter if you are a beginner, intermediate, or an advanced learner. 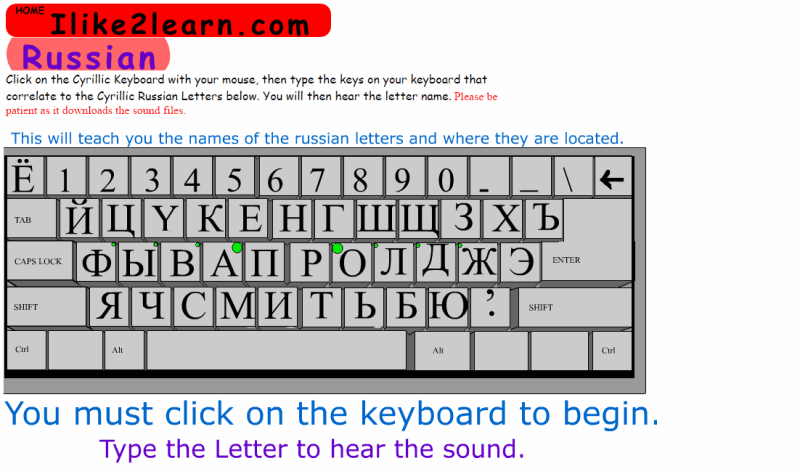 This website has course for all level of Russian language learners. There are Russian language courses available if you are travelling to Russia for business, or medical purpose. The courses have different lessons allocated to them. These lessons will teach you Russian alphabets, vocabulary, numbers, grammar, pronunciation, and much more. 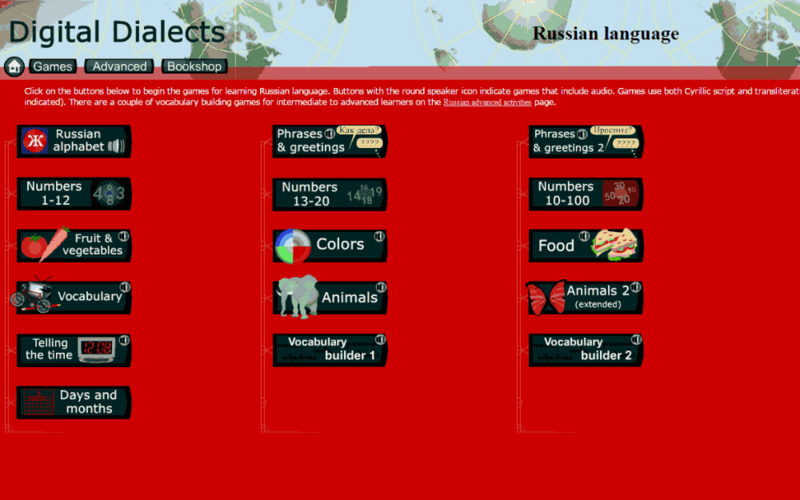 You can also play language games embedded with each lesson, and brush up your Russian speaking skills. 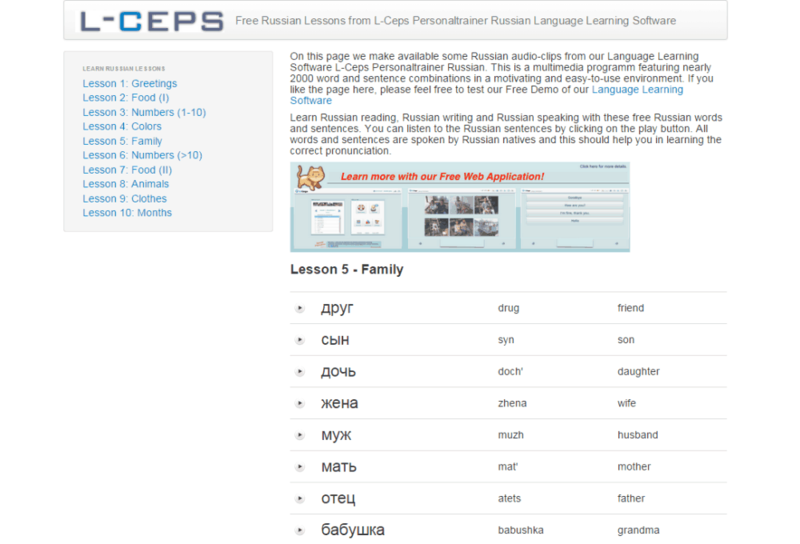 You can learn Russian online with the help of L-ceps.com. 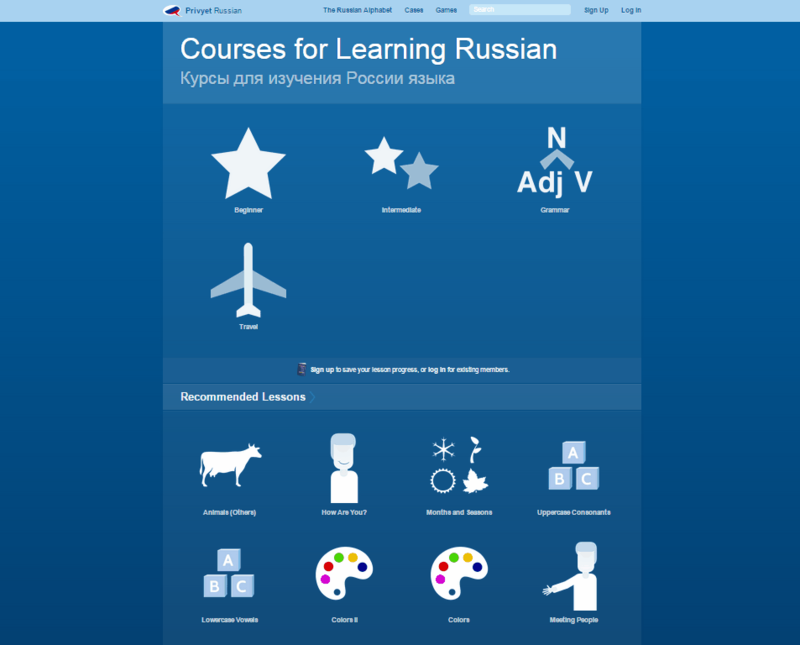 This multi-language platform has 10 lessons to offer in Russian language. 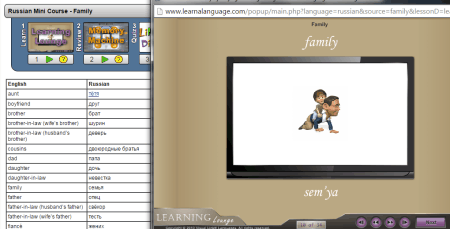 These lessons include words, and phrases based on topics, like: introduction, numbers, family, colors, months, food, etc. All the lessons are supported by audio playback. You can advance to higher levels of the language learning course, once you have strengthened your basics in Russian language. 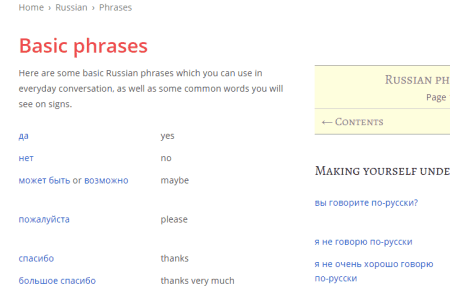 Memrise.com is a free online language learning platform, where you can learn Russian language. There are numerous lessons on this website, where you can learn different topics, like: Russian vocabulary, verbs, grammar, alphabets, pronunciation, etc. These lessons can be rated by different Russian language learners, so that you can view how efficient a lesson is. 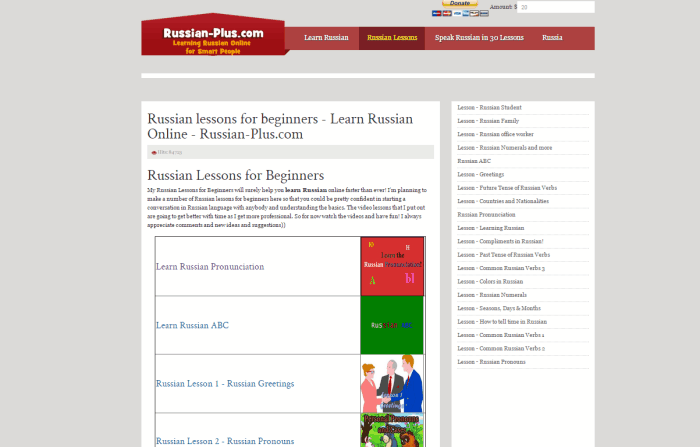 You will find basic, as well as advanced lessons in Russian language on this website. If you are good at a language, you can also create your own lesson for people to learn. 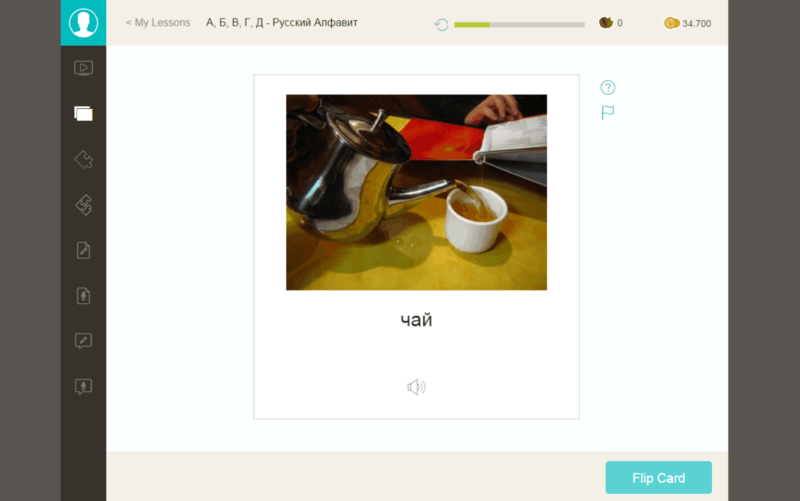 ilanguages is a place to learn Russian language for free. The Russian language study material is divided into 5 modules: Vocabulary, Phrases, Grammar, Flashcards, and Quiz. 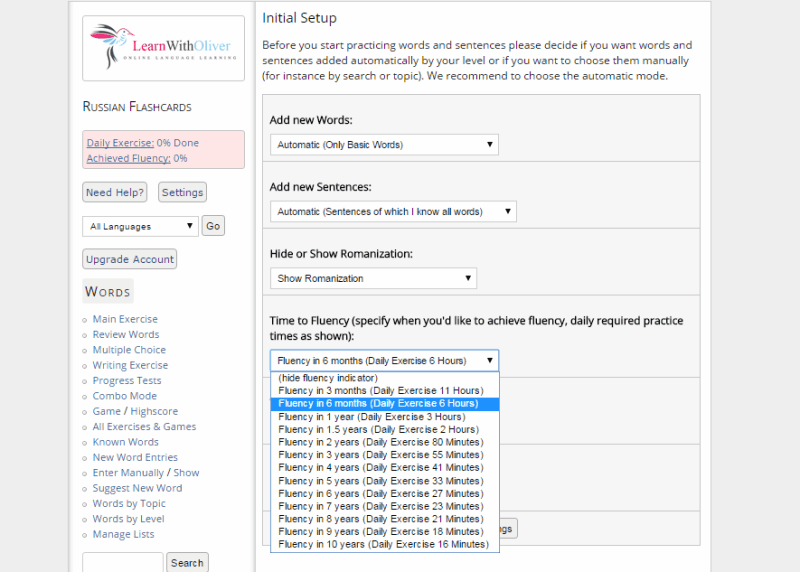 The Vocabulary, Phrases, and Grammar sections are fully supported by audio playback. 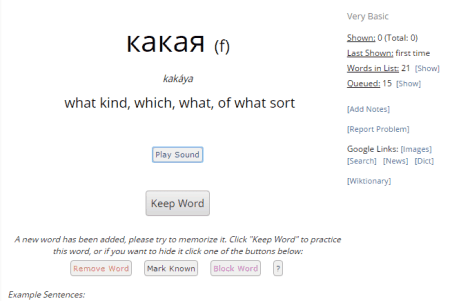 The Flashcard, and Quiz section lets you learn random new Russian words. Learn Russian online on Speak. This course is based on conversational phrases that are used in different situations. These phrases are common phrases that are likely to be used at certain places or given situations. These places and situations include: Introduction, Restaurant, Hotel, Taxi, Bank, Airport, School, Home, Downtown, Market, etc. Along with audio playback of conversation, you will also find animated rendering of the situation, or place. Goethe Verlag is another free website to learn Russian Language online. This is one of the most efficient online resource to learn Russian. It has 100 lessons in Russian language. The lessons are majorly based on Phrases we use at different places and situations. There are lessons based on grammar as well. All of these lessons are supported by audio playback. 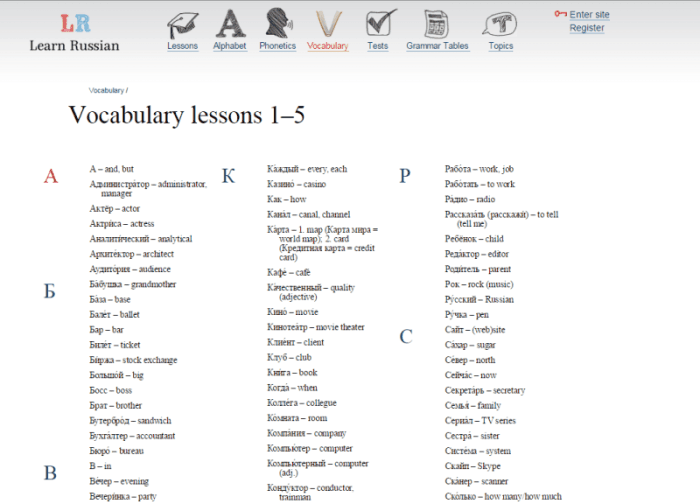 ielanguages.com has more than 50 lessons to learn Russian language. These lessons are distributed among 3 modules. 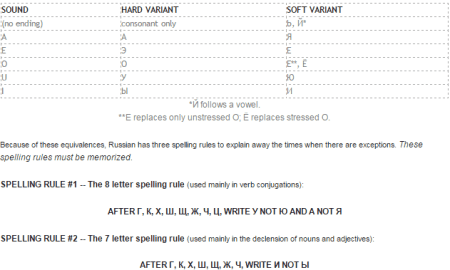 Module 1 has basic Russian grammar lessons, like: Alphabets, Phrases, Nouns, Gender, Pronouns, Adjectives, etc. Module 2 consists of Russian grammar lessons, like: Verbs, Tense, Conjunction, etc. Module 3 teaches you: Preposition, Adjectives, Phrase construction, Active and Passive voice, and about Russia. All the lessons have audios attached to them, which explain the contents. Vocabulary: numbers, days of week, points of the compass, colors, months and seasons, etc. All these modules and lessons are supported by audio playback. 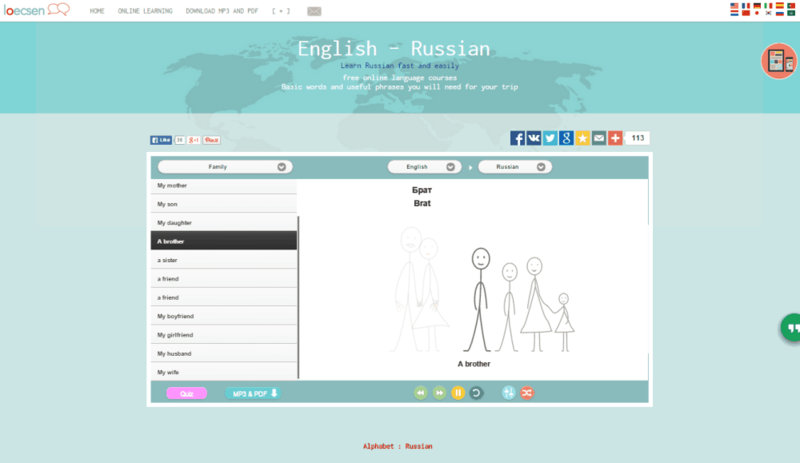 WeSpeke is an interactive website to learn Russian language for free. 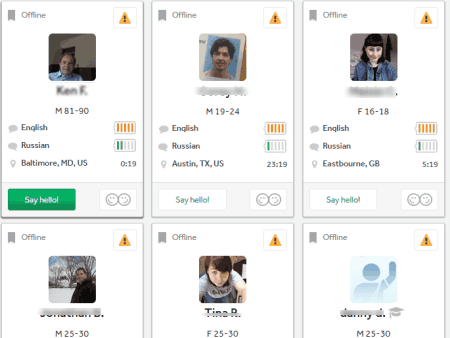 You get to interact and communicate with actual people, who know Russian language. Sign in to the website, set your language preferences, and you will be able to view people who know Russian. Select your native language, so that you can filter out people who know both the languages that you know, and are learning. Learn Russian online for free at Antosch-and-lin.com. You can learn Russian language from the basics. 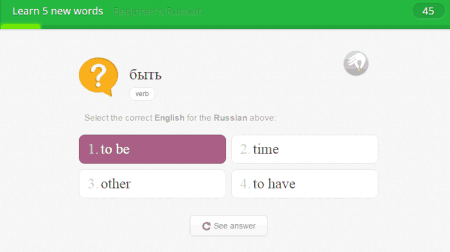 To start learning Russian, select your level, and select a time span in which you want to learn Russian. Learn Russian words, and phrases by listening to them. You will get random words to learn and practice on this website. ELanguageSchool is another good place to learn Russian language. This website has vast resources to teach Russian. 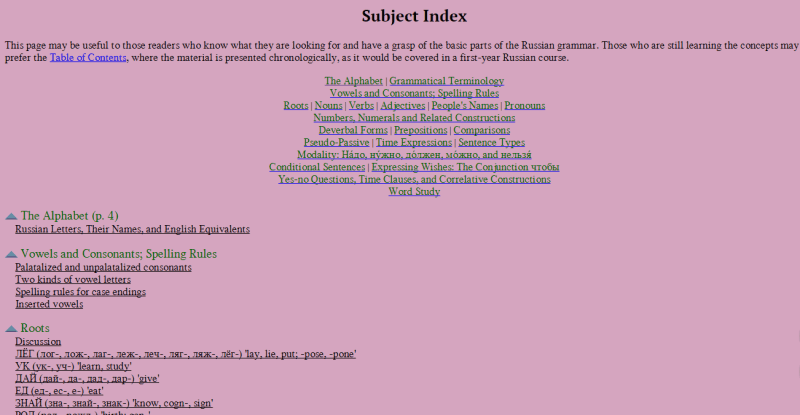 These resources include study material to teach: Russian Grammar, Words, and Phrases. You will also find a number of videos here, which will help you to strengthen your Russian vocabulary. The homepage for Russian language introduces you to Russian language, and Russia. 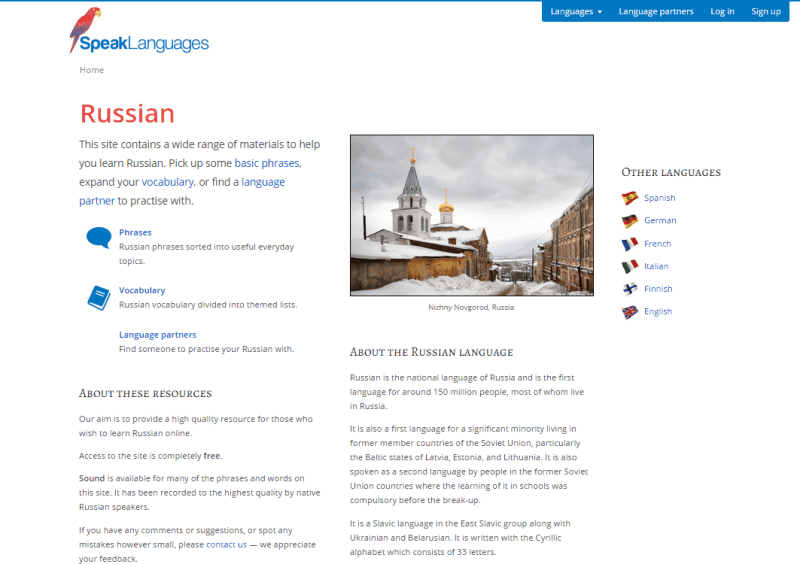 More than 40 lessons in Russian language can be found at MyLanguages. These lessons are one of the best resources to learn Russian online. You can learn basic, as well as advanced Russian language. These lessons include topics like Russian alphabets, numbers, grammar, vocabulary, phrases, and much more. These lessons are supported by audio. Other lessons include educational videos, quiz, radio, and transliteration. These tools can prove to be quite efficient while learning Russian language, as they are also supported by audio playback. Beginning Russian Grammar is free course in Russian language from Cornell University. 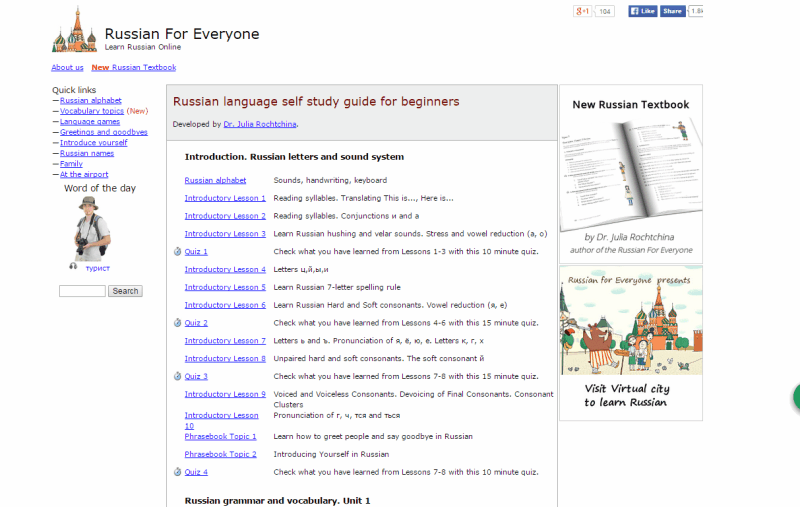 It has several topics which can help you to begin learning Russian language. 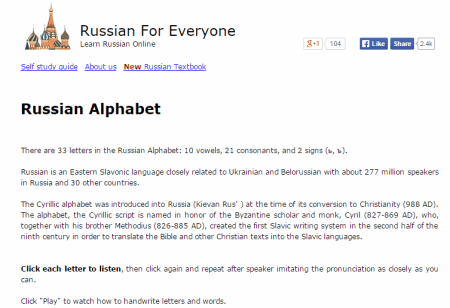 You can start with Russian Alphabets, Vowels, Consonants, Spelling Rules, Basic Grammar, etc. This course explains Russian Grammar very neatly, and extensively. You can also learn sentence formation, tense, numbers, and various other important topics. This is a very good website to build a strong base in Russian language. 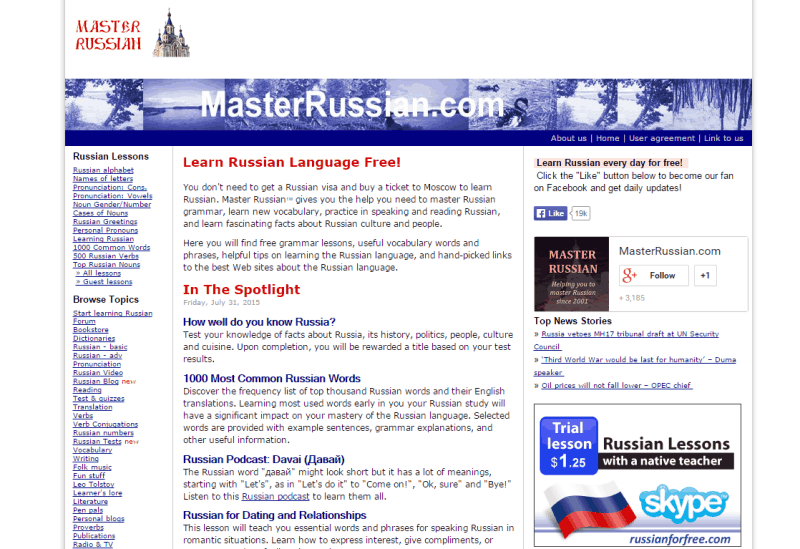 Master Russian is another good website to learn Russian online. 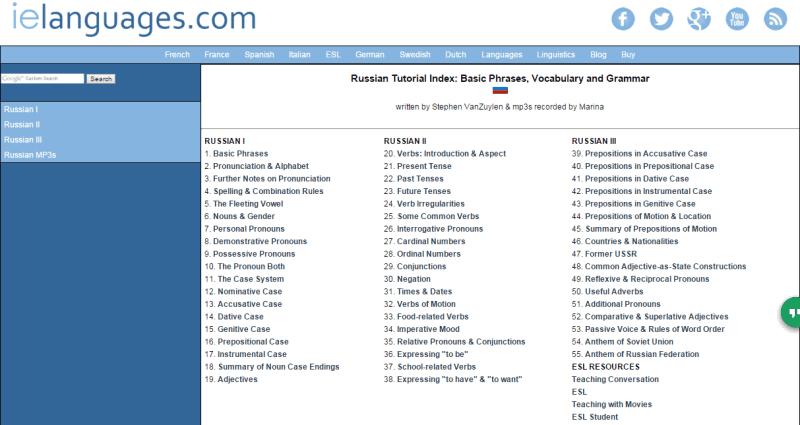 There are more than 30 lessons in Russian language on this website. These lessons include topics, like: Alphabets, numbers, grammar, Greetings, vocabulary, phrases, etc. All these are audio supported lessons. 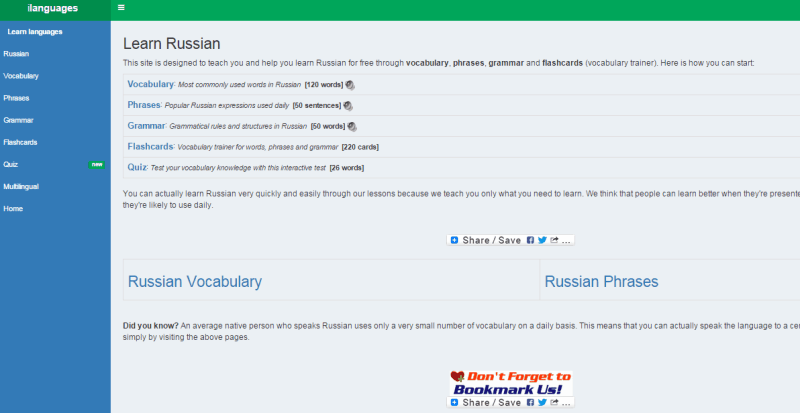 You will also find other interesting sections, like: Russian language Videos, blogs, translators, tests, dictionary, etc. RussianLessons.net offers free lessons in Russian language. The course is divided into 5 modules. 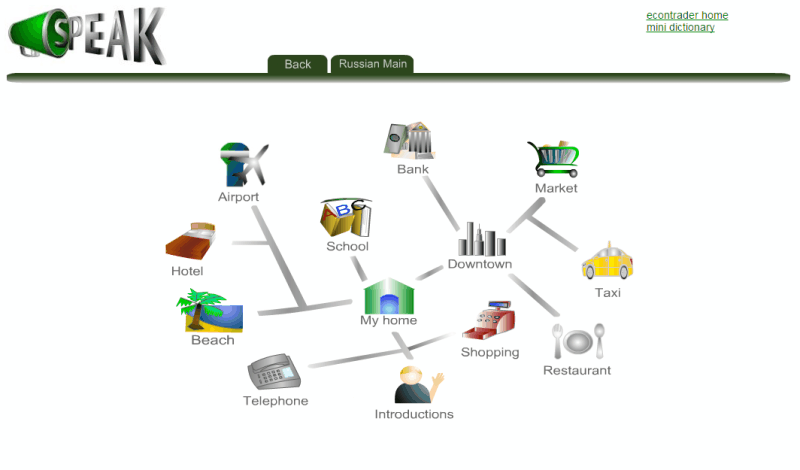 Russian Modules: It has lessons to teach you the basics of Russian language. These lessons include: alphabets, numbers, conversations, phrases, nouns, plurals, tense, verbs, etc. 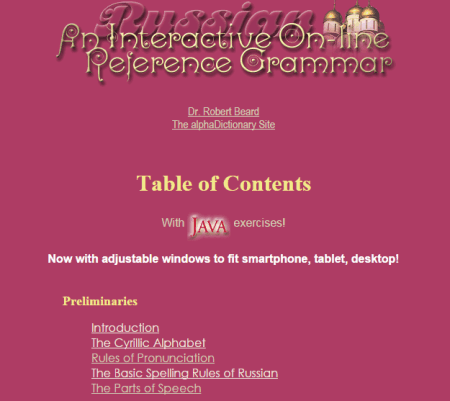 Russian Grammar: Learn advanced Russian grammar with the help of this section. Learn various topics, like: Different cases of Noun, pronouns, verbs, conjugated verbs, and adjectives. 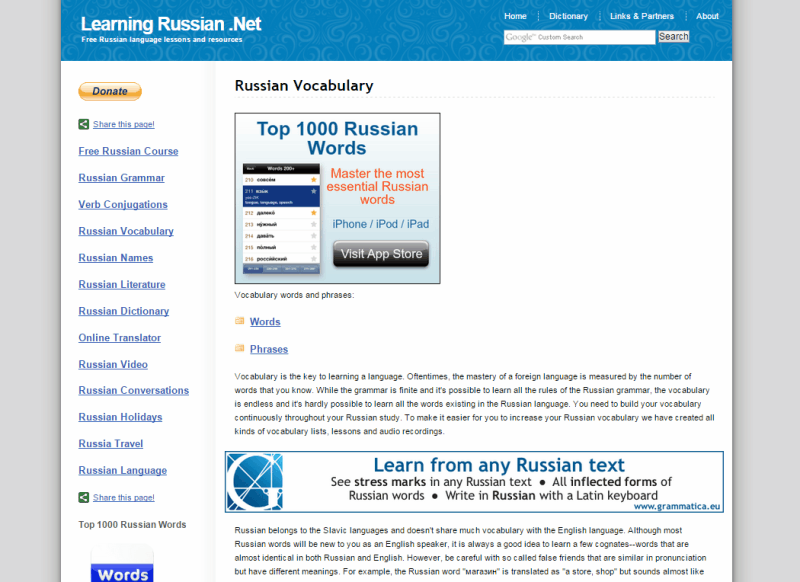 Russian Vocabulary: Increase your Russian vocabulary with this module. This includes: Russian names, numbers, question words, days, months, family, food, animals, countries, verbs, adjectives, etc. Online Russian Tools: This section includes various Russian language learning tools, like: discussion forums, dictionary, language trainer, transliteration, Russian keyboard, etc. 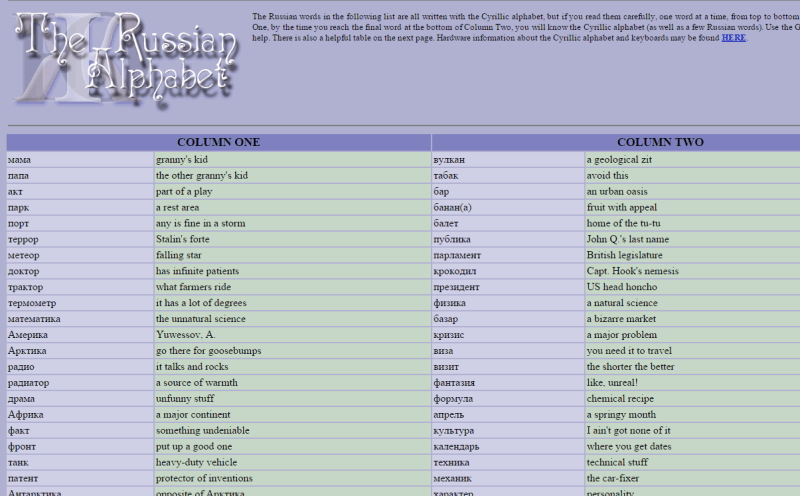 Miscellaneous: You'll find random Russian language learning tools, such as: Russian Quiz, Keyboard Setup, Guide, etc. All these modules are supported by audio playback. 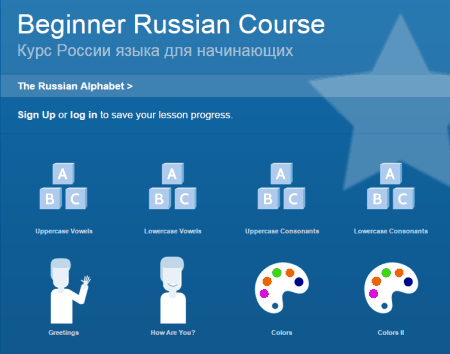 ilike2learn.com is a short Russian language course, based on vocabulary. It has 5 vocabulary modules, each divided for 5 weeks. Learn new Russian words with every module, along with their translation, and transliteration. 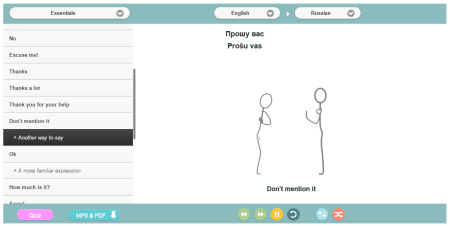 Totally supported by audio playback, it is a good place to learn new Russian words. You will find a series of Quizzes on this website as well. 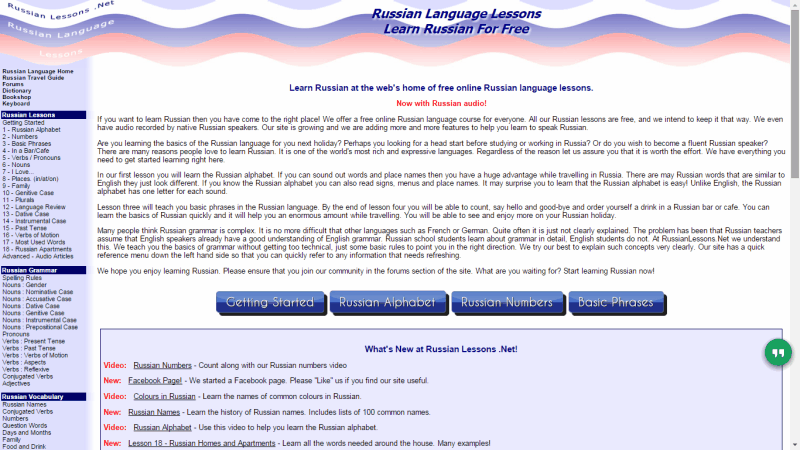 This is a good website to learn basic of Russian language. 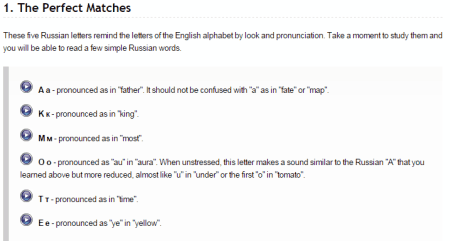 Alpha Dictionary is a content rich website, to learn Russian online. This website is primarily a place where you can learn Russian grammar. The course has 8 modules, and different lessons are assigned under those modules. These modules are: Preliminaries, Verb, Noun, Adjective, Pronoun, Preposition, Conjunction, Syntax, and Word Formation. There are various lessons under these modules, which explain every Russian Grammar topic in a detailed manner, with examples. You can also listen to audio and learn Russian perfectly. 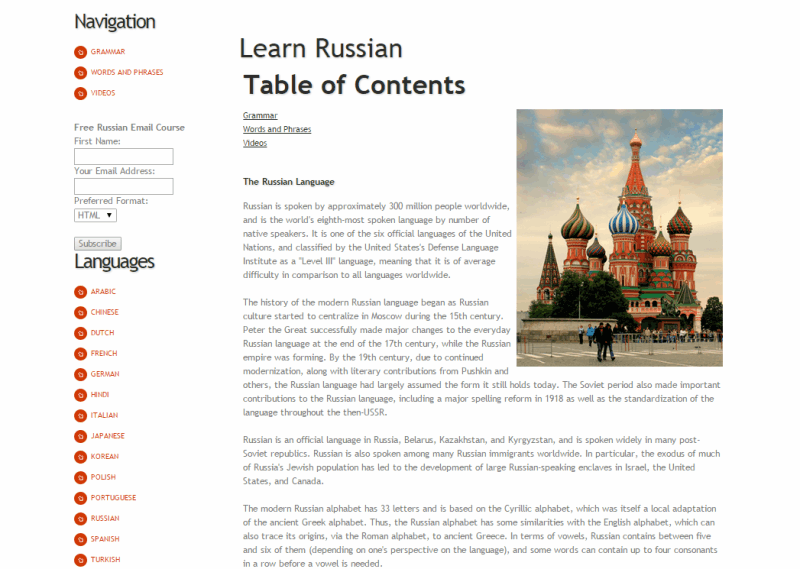 LearningRussian.net is another exciting website to learn Russian language. The resource is absolutely free, and you get to learn Russian from the basics. The website has more than 10 modules, and each module has different lessons. You have to start with Russian alphabets, and basic conversational phrases. The next step is Russian grammar, conjugation, vocabulary, etc. Resources and language tools, like Russian dictionary, translator, videos, and much more are available. Russian For Everyone is a self study guide for beginners to learn Russian online. You get to learn from the 4 introductory lessons about the basics of Russian, like: Alphabets, translation, syllables, sounds, etc. The next 9 lessons are quizzes, which are based on previous lessons. Once you complete the basics, you can move on to Russian grammar section. There are a total of 35 grammar lessons. These lessons are tailored to teach you Russian grammar very neatly. Along with these lessons, you can also take tests, and play quizzes based on Russian grammar. Look out for the Russian language games at the bottom of the website; these games are a fun way to learn and practice Russian language. LearnRussian.rt has one of the best and finest resources to learn Russian online. 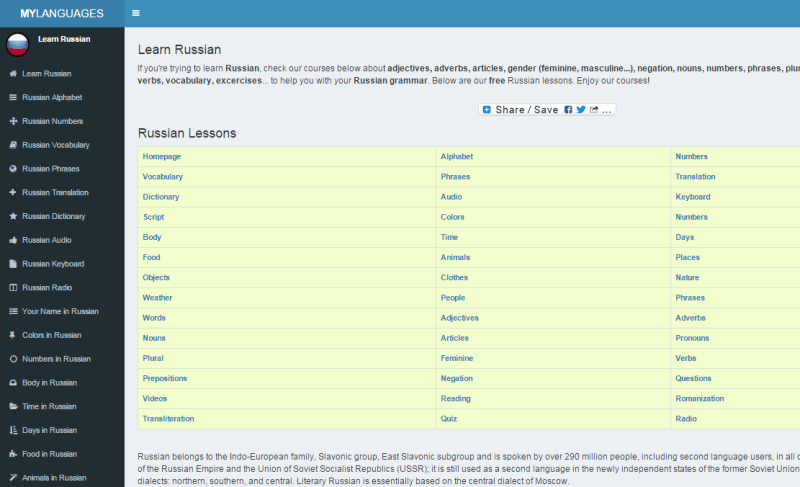 The entire Russian language learning course is divided into modules. Lessons: You will find 100 lessons here, which will teach you Russian conversational phrases, use of tense, sentence formation, speech, etc. 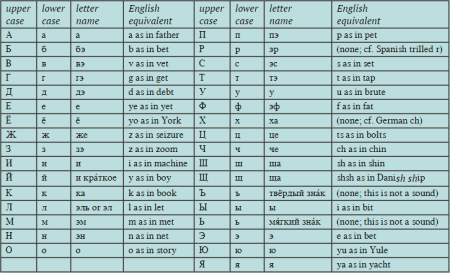 Alphabets: Learn all the Russian alphabets, along with their pronunciations. 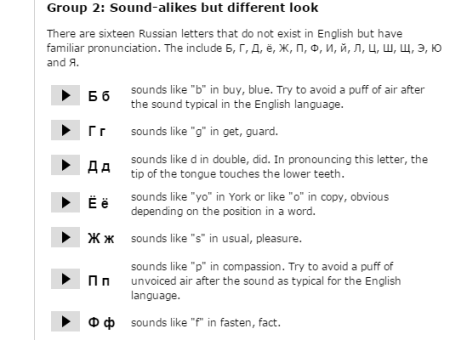 Phonetics: Listen and learn to read Russian letters, syllables, etc. 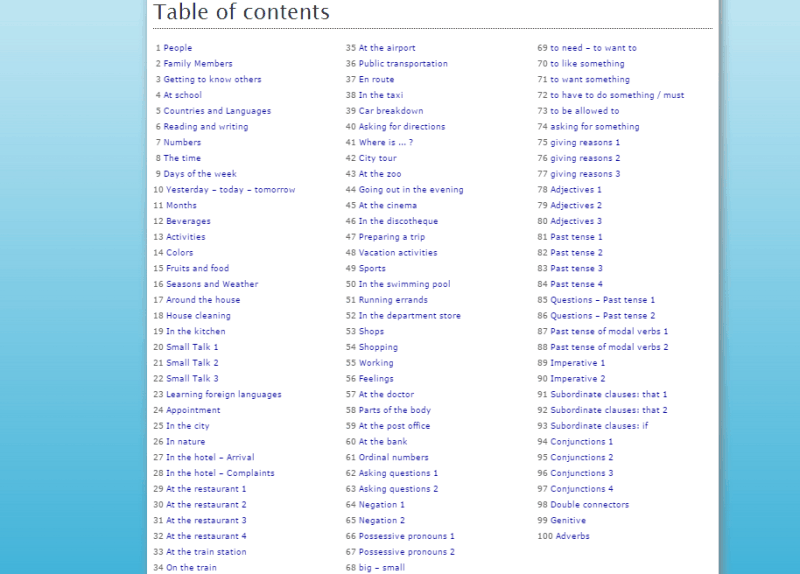 Vocabulary: 100 lessons available, with an extensive collection of Russian words, along with their translation. Tests: Take 20+ tests, to check your skills in Russian language. Grammar Tables: Look at the Grammar tables for different topics, like noun, pronoun, verb, tense, active and passive voice, etc. Download related PDF. 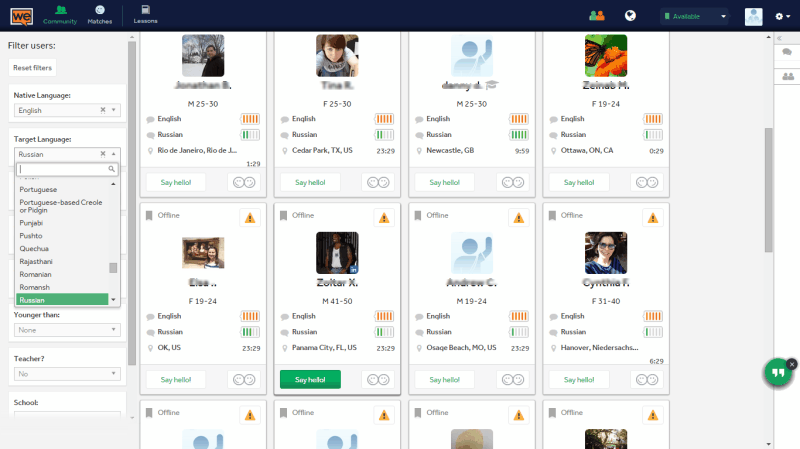 Topics: Find various conversations, based on different situations, and places. The method of explanation on this website is pretty basic, which lets you understand topics very clearly. You can register, and login, to track your progress, as you learn. Russian Courses: A list of courses to learn Russian language can be found here. This part covers most of the course. This section includes: alphabets, practicing alphabets, basic vocabulary, tense, nouns, adjectives, and their usage. 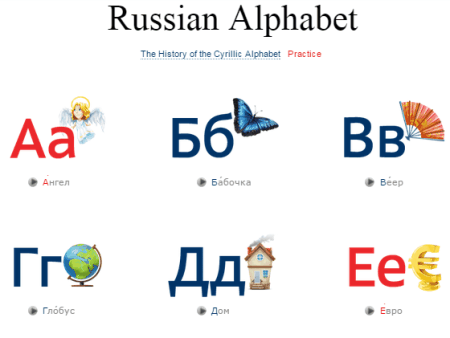 The Cyrillic Alphabets: Learn more about the Russian alphabets, along with pronunciation, and examples. Move on to the Advanced Russian course, when you are through the Basics of Russian language. The advanced section includes: Russian music videos, grammar tables, Grammar activities, Russian cartoons, comics in Russia, and Russian forums. The lessons in these Modules are carefully crafted to teach Russian language, right from the basics. The course begins with Russian alphabets, phrases, words, and eventually builds up on Russian grammar. Few lessons are based on text, and audios, while some are totally based on videos.